Since all the paper conservation treatments of Brader drawings performed by senior paper conservator Gina McKay Lodge in preparation for the past Ferdinand Brader exhibition (Canton Museum of Art, December 4, 2014 – March 15, 2015), many more drawings by this artist have come to the Cleveland area art conservation center for treatments. The exhibition and the research conducted by its curator Kathleen Wieschaus-Voss have caused many more of Brader’s drawings to appear from obscurity, oftentimes from the homes of descendant owners of the farmsteads depicted by the artist. One is in treatment here now, the 15th Brader to be treated here, and comes to us from our client The Little Art Gallery of North Canton, Ohio, a permanent collection of 197 artworks with special exhibition spaces recently described in the press as a “Hidden Gem.” Their Brader drawing was a recent gift, from Carl Lincke of the family whose farmstead is depicted. Many years ago, McKay Lodge Art Conservation Laboratory’s president Robert Lodge performed The Little Art Gallery’s first collection condition survey and built its first database. The Ferdinand Brader drawing is suspended on a polyester screen in an alkaline bath, under a bank of lights for the reduction of overall discoloration and the dark line. 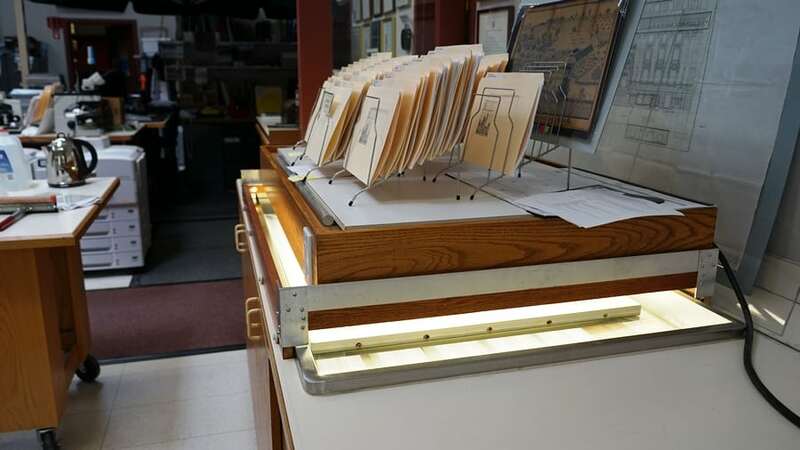 This “light bank” treatment is a standard procedure in modern paper conservation and has been proven to be safe when properly performed. Under the right conditions prepared by the paper conservator, the energy of the light will break the chromophoric molecules that make the color of the stains, thus removing the color, without also affecting the natural color of the paper nor the drawing’s media. 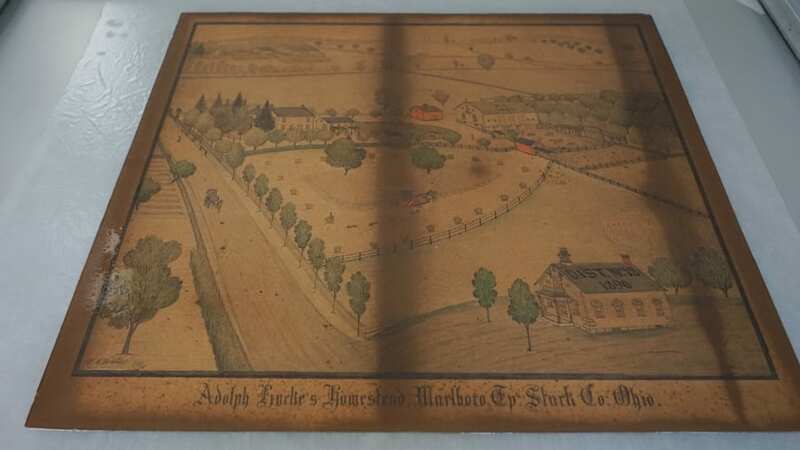 The medium-sized colored pencil drawing depicts Adolph Linke’s Homestead of Marlboro Township in Stark County, Ohio. Its condition is entirely typical of so many of Brader’s drawings: discolored paper and a dark stain line related to a break in the original framing’s wood backboard. Because so many Brader drawings have been treated here, so many having identical conditions, the treatment procedures here have been well rehearsed and have become highly economical and effective. Brader paper conservation treatment restores not just a good appearance, but also provides a significant extension of life. 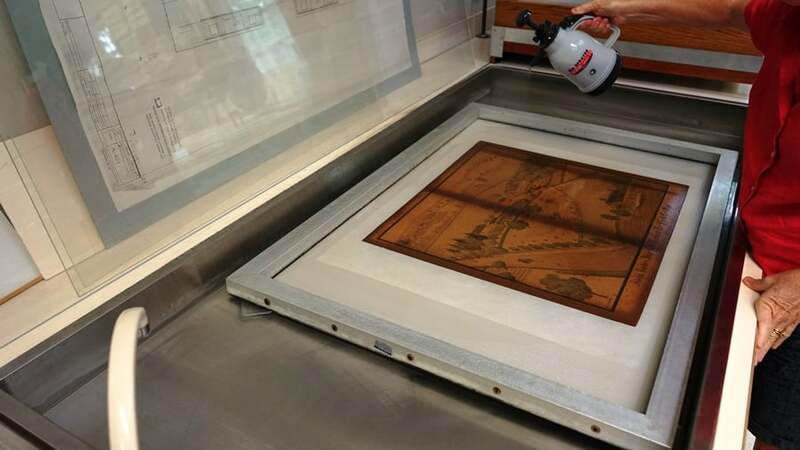 During a break in the light bank treatment, senior paper conservator mists the Brader drawing’s surface to keep it from developing dry areas. McKay Lodge Art Conservation Laboratory was called upon to be the consulting conservator for the exhibition “The Legacy of Ferdinand A. Brader” organized by one of our art conservation clients, the Canton Museum of Art of North Anton, Ohio (Canton Museum of Art, December 4, 2014 – March 15, 2015). The art conservation center was so impressed with these unique drawings and the work of the exhibition curator Kathleen Wieschaus-Voss that, in addition to a donation of art conservation services to the museum for this exhibition, McKay Lodge Art Conservation Laboratory joined other exhibition sponsors with a $10,000.00 gift to help further the effort to greatness.